The path to value creation in business is very much about managing and balancing your tactical everyday decisions with the strategic big picture of where you are heading. A year ago, I took on the CEO role at Datagate, an exciting fin-tech start-up, after spending over a decade as CEO of a larger business group. In an early-stage business, this balance between tactical and strategic is even more critical, because your decisions will shape the nature of your business for (hopefully) many years to come. 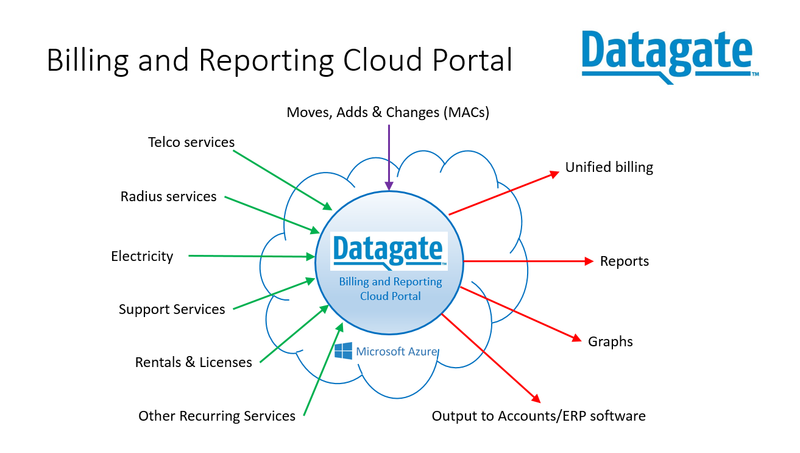 Datagate at a Tactical Level; Datagate is a white-label, Cloud-based billing and reporting portal for service resellers. We connect to all sorts of different service usage data (mainly from Telco’s, Electricity companies and Cloud services) from which we produce invoices, reports and customer portals for resellers of those services and their customers. 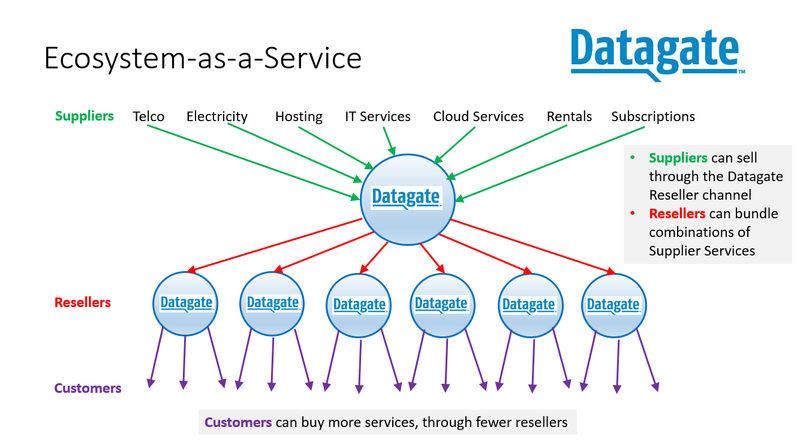 Datagate at a Strategic Level; Datagate is an “Ecosystem-as-a-Service”. We are building our base of service resellers and our base of service suppliers and enabling them to work through each other to strengthen their business reach and profitability. As we add more resellers and suppliers, the strategic value of our ecosystem increases dramatically. We are strategic to our service resellers because we enable them to sell a range of services from a range of suppliers and combine or bundle them on to a single offering and/or a single invoice. For example we enable Telco resellers to sell Telephony combined with Electricity. We are strategic to our service suppliers because we enable them to sell through our channel of resellers, who all use the Datagate billing portal. On a day-to-day basis it’s easy to get entrenched in the important but tactical demands of your business, such signing up deals, building revenue etc, but it’s important to keep in mind where it’s all heading. Do the suppliers, deals and customers you’re signing up fit with your strategic long-term view of the business? In my case, Datagate is building a valuable ecosystem through our product and the partners we sign up – and that value will become more self-evident as the business grows. At the start it is a visualization, but over time it becomes a reality. This week Enprise announced its acquisition of Datagate Innovation Limited, which is a Cloud Software Developer that specializes in on-line reporting and billing portals for Hosted Service Providers, Telco’s and Utility Companies. Following the acquisition, Datagate’s founder, Tim Mulcock is staying on to lead Datagate in the role of Managing Director and he also becomes a significant shareholder in the wider Enprise Group. Prior to founding Datagate, Tim was a co-founder of EMS Cortex, a global Cloud Control Panel provider for the Cloud/hosting industry – which was acquired by Enprise and subsequently sold to Citrix Corporation in 2011. Tim also has extensive industry experience, gained from working within Telecom New Zealand and also as a co-founder of Bizo – a New Zealand hosted service provider that was later sold to Orcon. I’m enthusiastic about the synergies between Datagate and Enprise. Datagate will leverage Enprise’s extensive international contacts within the hosting industry (from our time with EMS Cortex) and also leverage our strong background in Business Management and ERP Software. Already, Datagate and Enprise Solutions are talking in unison with common potential customers. Enprise will also benefit from Datagate’s laser-sharp industry focus on Cloud and Hosted Service Providers – which is a strong global market vertical that Enprise can apply to its international sales channel and ERP-based partnerships. Specialisation is so important when you’re operating in the large global markets. This will be a strong new focus for Enprise. This week Enprise Group announced its investment in Melbourne-based Cloud Solution developer, Accountability Access Pty Ltd. Accountability is a Cloud-based Job Management and Accounting solution designed specifically for creative and communication agencies. Its customers are typically multi-branch, multi-national businesses in the creative, communication and advertising industries who want an easy to use, pay as you go, Cloud solution to process and track the accounting and billing of their projects. The solution includes a full browser based client, an iPhone/iPad applications and is built on the latest Microsoft technology with multi-currency, multi-lingual capability. I am excited about this investment, as it signals the start of another global sales partnership for Enprise Group with Accountability. Accountability is a superb product with huge market potential and Enprise has the experience, capability and global footprint through its channels in North America, Europe, Africa and Australasia to significantly boost the existing Accountability sales channel. A new business unit will be set up within the Enprise Group specifically to market and support Accountability. It will be able to leverage the resources of the group, including the depth of accounting and job costing expertise of our team, plus our branches in Auckland, Hamilton, Wellington, Sydney, Melbourne and Pretoria. This week Enprise Group is very pleased to announce that the assets of EMS-Cortex (one of the businesses of the Enprise Group) were acquired by global technology leader, Citrix Systems Inc. Citrix has approximately 5,000 staff worldwide and annual revenues exceeding US $1.8 billion. We are absolutely delighted with the deal and I think this is a very positive development for all stakeholders in EMS-Cortex including customers, staff, management, shareholders and investors. Citrix has hired all of the staff from EMS-Cortex and intends to continue developing the Cortex Cloud Control Panel from Auckland New Zealand. The business unit will continue to be led locally by former EMS-Cortex General Manager, Colin Williams, who will in turn report directly to Bill Burley, a Citrix Vice President based in Florida, who is the General Manager of the Citrix Cloud App Delivery Group. The Cortex Cloud Control Panel, which is used by Hosted Service Providers around the world to provision and manage Cloud applications, is now owned by one of the world’s most innovative and respected technology leaders. Another outcome of this deal is that it will result in Citrix having a bigger presence in New Zealand in the form of a local development arm. I’m optimistic that this will result in a further New Zealand-based jobs and opportunities being created going forward. It is great to see our investors, who include TMT Ventures and the NZVIF realise a great return on their investment in EMS-Cortex and the Enprise Group. The millions of dollars returned to them through this EMS-Cortex deal will no doubt end up being re-invested back into the New Zealand IT industry, creating further jobs and opportunities for New Zealanders. I look forward to seeing the EMS-Cortex team and the Cortex Cloud Control Panel go from strength to strength as part of the global Citrix business. For my part, I shall now be focusing my energies on the remaining two great businesses of the Enprise Group; Enprise New Zealand and Enprise Software. For Citrix’s perspective, refer to the blog of Vice President and General Manager, Citrix Cloud App Delivery Group, Bill Burley. TELUS hosted service customers are embracing the self-service capability provided by Cortex software. TELUS Customer Solutions is using the Cortex cloud control panel to support hosted Exchange, SharePoint, Microsoft Office Communications Server, and Blackberry Enterprise Server. “Cortex is supporting TELUS’ strategy of differentiating itself in the market by giving customers the tools to combine new products with existing ones,” says Renaldo Scalabrino, Marketing Director TELUS Customer Solutions. The EMS Cortex Cloud Control Panel has a rapidly-expanding customer base that now includes some of the leading and largest Cloud Service Providers from around the world. This has not been achieved by spending a fortune on global marketing, but rather by a concentrated focus on quality, product innovation and good-old customer service. 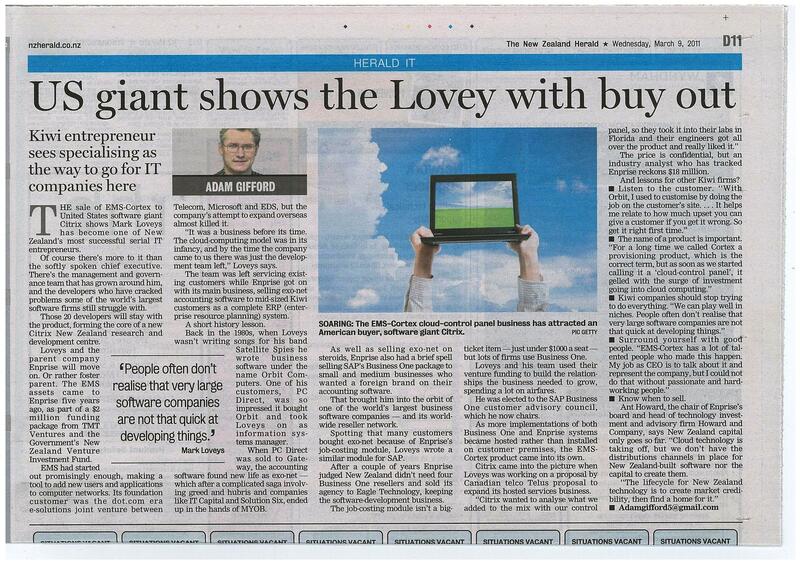 “We are winning more business now, and Cortex is our biggest differentiator. Ease of use is the thing that clients can truly see and appreciate, and when we show clients the Cortex interface, they say ‘Wow’”. These quotes are extracted from an EMS Cortex Case Study featuring Internet Solutions of South Africa. Here is some great customer feedback that our team at EMS Cortex received today from Eric Malatesta of Venyu, a valued Cortex Service Provider based in Baton Rouge, Louisiana, who has started using the Cortex Cloud Control Panel to manage their hosted services. First, what an awesome product. Cortex Provisioning has been all I could imagine, and more!!!!!!!!! We are having a lot of success with this product, and our clients love the easy to use interface. My administrators are loving it as well, and have little need to ever log into the backend servers at all. I think of this product as the beginning to a lot of my other projects. Thank you for the kind words Eric and congratulations to the team at EMS Cortex. EMS Cortex has always supported and been a strong advocate of Citrix products and technology because we believe that a truly successful Cloud strategy requires that ALL of a business’s applications reside in the Cloud – not just some of them. Given that so many business applications are based on Microsoft Windows and given that Citrix is the technology & market leader in delivering scalable, efficient and reliable remote access & virtualization to Windows applications and desktops, it’s hardly surprising the so many of our Service Provider partners are also Citrix Service Provider partners. We see our product Cortex as the “Single Pane of Glass” that provisions and manages all of the popular Microsoft applications (such as Exchange, Sharepoint, CRM, OCS etc) along with the nearly infinite list of applications that can be delivered using Citrix XenApp technology. During the last couple of months, EMS Cortex has been working more closely with Citrix and in particular with Scott Swanburg, who heads the Citrix Service Provider program. See what Scott and Citrix Engineers have to say about EMS Cortex in this Blog.